Oh the places we’ll go! The things we’ll see! We often get asked, “What’s your next adventure?”, as if it is a natural and dare I say, an obligatory portion of our life. In some ways I think it is, as life is relatively short and we have been blessed with natural athleticism and adventurous spirits, so it would be a disservice if not a “sin” to fail to use said blessings. In doing so, there is the added bonus in that we feel more connected to both nature and humanity, which in fact also enriches our personal relationship with God. We are more balanced. Calmer. Connected to the true essense of what really matters in this blink of an eye existence we call Life. In researching the Grand Enchantment Trail we have been reading blog posts (which are few and far between), scowering the GET guidebook and maps (thanks to Brett Tucker, the route’s founder), that when printed is in very small print which becomes problematic when ones arms are not long enough these days. While I know I can download it (and the route’s topo maps), or read it on my iPad (with enlarged print), there is something about paper in hand and a yellow highlighter that makes the research more “real”, and allows its information to stick. I can’t help but feel a bit anxious about the planning for and actual execution of another long distance hike. Considering our track record there are so many things that can go array, both in the prelude to the hike and during said hike. In fact, a few weeks ago I went threw a week long bout of back spasms, most likely a result of overexubant training, and currently my knee is a bit sore from a recent ski trip…and well, a unique “yard sale” fall (or rather landing) that required taking “inventory” while lying perfectly still, breathing through a mouthful of snow. My husband’s remark, was “Wow, you looked like Pete Rose sliding into home”. I forget sometimes I’m no “spring chicken”. The mind is willing but the body reminds us that they are doing all the work. As I write, I am currently awaiting my fate as a potential juror in fulfillment of my civic duty as an American. Whether I get chosen or not may alter our current plans. Most people don’t think to traverse the desert, let alone two desert terrains and 14 mountain ranges on purpose. And in this case, we would be beginning a little “late” in the season, as Arizona’s “Spring” is akin to “Summer” at home. Never one to turn down a challenge, we have completed most of our preparations for this hike. Our intent is to attempt it all the same, and yet may in fact call an audible in the event the heat is too much (as in on the dangerous side for me and my hydration/electrolyte heart issues). We expect this trek to take not more than 8 weeks, as we will not be so much concerned with packing in the miles as we will be concerned with soaking up the sights. One thing we have in our favor is that it appears to be a “wetter” Winter and hopefully Spring, and as it turns out, these deserts (Sonoran and Chihuahua) are not as barren as one would think. These particular deserts are somewhat of an oxymoron in that they are considered “wet” deserts teaming with flora and fauna. 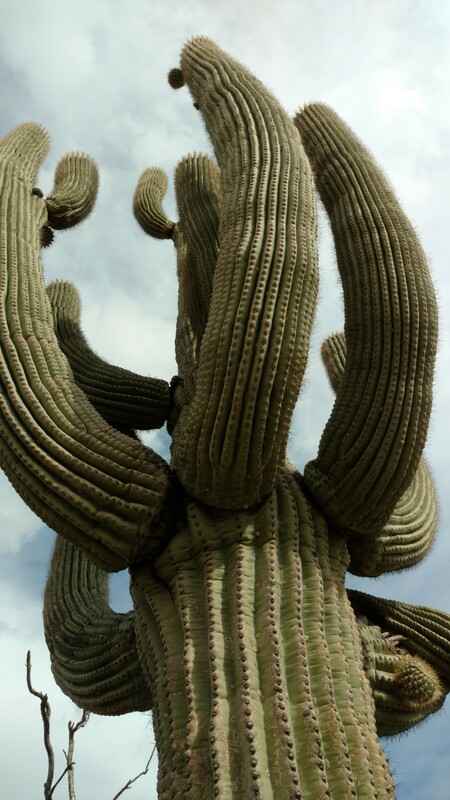 They contain nearly 300 species of cacti (the saguaro, pronounced “sa-WAH-row” being some of the oldest, tallest and slowest growing). Of the 14 mountain ranges we will traverse, there are more than 4 “opportunities” to be over 10,000 ft, which this year most likely means walking in/through snow. 90 miles of the route include walking next to, over or through at least 3 rivers (as in the river is the trail), and numerous slot and box canyons complete with their own unique ecosystems. There will be a multitude of furry critters (to include, deer, mountain lions, black bears, javalenas, rabbits, elk, onyx , and antelope), and of course reptiles and arachnids, hence “cowboy” camping will be kept to a minimum. This entry was posted in The Grand Enchantment Trail, Uncategorized. Bookmark the permalink.